Our Purpose: To be a reflection of Christ’s love, his hands and feet, in service to our neighbors in the community and the world. The Path Program offers shelter, meals, and hospitality for families with children who have transitional housing needs. We partner in this service with 12 other local congregations annually through the New Pathways organization in Cambridge, MN. Trinity Lutheran Church provides private rooms and meals. Guests use the day center at New Pathways during the day. Trinity members have opportunities to be involved and share their time and gifts by providing three meals a day, setting up and taking down beds, washing laundry, playing games with the children, helping with homework, and interacting with guests. For more information, see www.newpathwaysmn.org. The Path Program is ready to start the new year with a big change! We will be hosting 2 weeks at a time this year but will only host 2 times. Our average one week hosting period takes about 34 volunteers with 250 volunteer hours. Thank you to all those dedicated volunteers!! A 2 week hosting period will be a challenge but we believe Trinity is up to it. Please mark your calendars and prayerfully consider helping with this wonderful program. We will have sign up sheets out a few weeks before hosting. If you would be interested in helping or want to learn more about the program please call Shari Denny at 651-214-5578 or Teri Goebel at 612-209-1814. Due to the overwhelming response we have received from donating Blessing Bags we have decided to make a few more for summer needs and also make some for children of homeless people. Items can be dropped off in the church office or the box in the Narthex. Needs and ideas for children include small packs of Kleenex, chap stick, shampoo, soaps, toothpaste and brushes, notebooks, colored pencils, juice or drink boxes, hair accessories, combs, small toys or card games. Needs for adults remain the same as previously posted and include rain ponchos, small flash lights, tooth brushes and paste, hand wipes, snack packs (no chocolate due to melting in summer), socks, soaps, razors, feminine hygiene products, Band-Aids, beef jerky, sunscreen, chap stick. Do you love worship? Do you like helping others? Have you always wanted to help in some way? Join us on the 1st Sunday of the Month at Ecumen for worship. Assisting with communion Maybe you would like to provide special music. Perhaps you would like to provide a homily to share how much God loves us. The service is at 10AM the first Sunday of each month. Come and check it out and see if it is a ministry you would like to be part of it. The residents are SO appreciative and they love to sing. There are 3 other churches that each take a Sunday. As far as we know, Trinity is the only one that brings communion. It is a joy to serve in this way. Come and check it out.. Contact Ann Tanko (artanko@hotmail.com) or call the church office for more information. 651-674-7047. 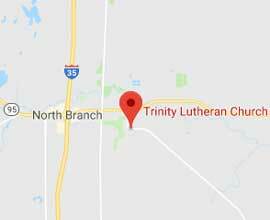 Trinity works along side the Crisis Nursery and Chisago County Human Services during the Christmas Season to provide ‘Christmas Presents’ for children and families in need. A Christmas Tree is present in the Narthex area of the church with ornaments for families to take and buy the necessary item listed. Trinity Lutheran Church has been part of the Bega Kwa Bega (Shoulder to Shoulder) program between the Saint Paul Area Synod and the Iringa Diocese in Tanzania since 2001. We have been blessed to have been paired up with the Pawaga congregation and have found many ways to partner with them in ministry. Together with the members of the Pawaga Parish we raised funds to build a home for the pastor of Pawaga. Pastors in Tanzania are expected to take in those who do not have their own housing, especially young children who have lost their parents. Pastor Ruben had been living in a very small house without the needed room for his own family and those who have needed his hospitality. During the last few years we have been working together to build a new home for Pastor Ruben and his family. The outside of the house was finished in December of 2006, however we continue to raise support to finish the inside and provide much needed furnishings. “Education is Wealth” was the school motto for the Pawaga Secondary School – the statement is the reality in which the Africans live. Education is needed for families to become self-sufficient, yet education is a rarity for many. It costs a student $360 to attend secondary school for one year, considering that the average family’s income is $800, this is impossible for most families. We have been able to sponsor 21 students in their secondary education for the 2008 school year. We still have many more in Pawaga who need the opportunity to further their studies, help their families, and make an impact on the village. The winter of 2006-2007 provided an opportunity for our global mission team to visit our brothers and sisters in Christ in Pawaga. The experience opened our eyes to how small the world really is, and how large God’s grace is. For three weeks we were able to learn the culture, eat the food, and experience the generous hospitality of the Tanzania people. We were continually in awe of their trust in God and their hope in the future. We could not have imagined that we would leave Tanzania with lasting friendships and a new sense of what it means to be a Christian community. We realized that our partnership is not so much about building houses or churches, or sending students to school, as it is about the face-to-face relationships and experiencing life together. It is our hope to send another group to Tanzania the winter of 2008/2009. If you are interested in more information about the partnership between Pawaga and Trinity, sponsoring a student, or going to Tanzania please contact Ann Tanko or call the church office at 651-674-7047. ELCA Good Gifts provides more than 50 different gift-giving options that grow the church, fight hunger and transform lives. These gifts, starting at just $10, provide direct support for the churchwide ministries of the ELCA. The resources below – from catalogs to coin banks, bulletin inserts to planning guides – make it easy (and fun!) for your family, your congregation and your community say “goodbye” to traditional gift-giving and “hello” to meaningful gifts that really make a difference in the world. Ready to shop now? Visit the ELCA Good Gifts Store and print or order cards to tell loved ones about gifts given in their honor.